Today I’m continuing on with my series on Preserving Fresh Apples. My aunt shared many bushels of apples from her tree this year and I’m making sure to get them all preserved, I certainly don’t want that apple deliciousness to go to waste! I’ve been busy making and canning apple pie filling, apple butter, applesauce, etc. but one of RancherMan’s favorite ways to enjoy these apples is for me to sprinkle apple slices with with cinnamon & sugar and dehydrate them into sweet apple chips. Check it out! My aunt told me she simply used this handy *apple corer/slicer/peeler, sprinkled the apple slices with cinnamon and sugar and put them on a tray in her oven set to 200 degrees for about 9 hours to dry and crisp them. It seems she told me she cracked the oven door open during their drying. But I just couldn’t stand the thought of having my oven turned on for that length of time pumping heat into the house during the hot & humid dog days of our NE Texas summer. So I thought I’d try to dehydrate them in my *Excalibur dehydrator instead. I can set that bad boy outside and have the drying heat stay outside where it belongs! So RancherMan & I hit the kitchen slicing/peeling and coring apples using this amazing peeler that has a suction cup to secure it to our counter. 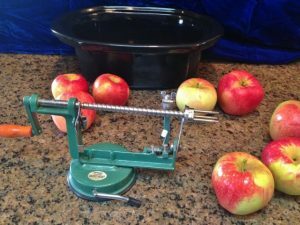 I’m not gonna lie – I’m in love with this thing, we can peel/slice and core an apple in seconds! When my aunt made hers she left the apple rings whole. But I liked the thought of half rings better so I cut all my slices in half. I placed my dehydrator trays on a metal rack with newspaper beneath it so when I sprinkled the slices with cinnamon and sugar I could capture and reuse all the mixture that would have otherwise fallen from the trays and been wasted. I just brought up the edges of the newspaper so the cinnamon and sugar would slide to the middle of the paper and poured it all back into my shaker bottle. EASY! Once my apple slices were sprinkled with the cinnamon sugar mixture I placed the dehydrator on a small table on our back porch and loaded the trays into it. The temperature dial was set to the highest setting available – 155 degrees. I rotated the trays after a couple of hours to help them dry evenly. The trays of apples dehydrated for about 14 hours. But although the apple chips were completely dry they weren’t crunchy like my aunt’s were. I guess my dehydrator just didn’t get hot enough to crisp them. Hummm, what to do…. I moved the dehydrated slices to a couple of large baking trays and placed them in my oven. I turned the oven on preheat for only about 2 minutes to get the oven good & hot. Then turned the oven off again. I left the trays in the oven just soaking up that drying heat until the oven cooled completely. When they were cool I tasted them for crispiness- success! RancherMan says these little apple chips are fully addictive. He loves to grab a handful to snack on during the day. I must agree with him, they ARE addictive, deliciously crunchy and sweet! And now that they’re dehydrated they take up very little space and no additional energy to store. I just placed them all into airtight containers. I won’t be able to tell you how long they will store because my handsome man is eating them up quick! But I guess that’s what you hope for when you preserve the harvest… that the fruits of your labor will be eaten and enjoyed. Now that makes my heart happy! 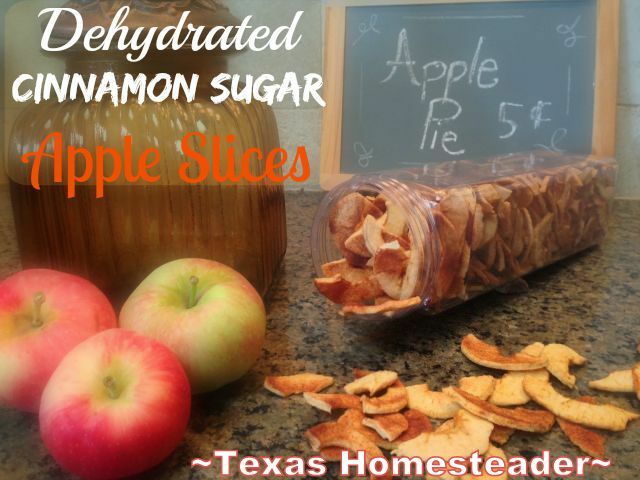 This entry was posted in Blog Posts and tagged Dehydrating, Environment, Fall, Food Preservation, Frugality, Make-It-Yourself, Recipes, Summer on September 5, 2015 by Texas Homesteader. I love apple chips – these look delicious! Thanks for sharing on the What’s for Dinner link up! Ooo definitely saving this for later. I want to go apple picking soon and it’ll be perfect to make treats for the kids in the dehydrator! Thanks for linking up at #SustainableSundays! Yum! What a great idea to use your dehydrator for most of the heavy lifting then finishing in the oven. Thanks for sharing on the #WasteLessWednesday Blog Hop. Can’t wait to see what you share this Wednesday. We are leaving shortly to go apple picking which means tomorrow I will be processing lots of apples…now I have one more way to enjoy them. Thanks for the inspiration! I have both fresh apples AND an Excalibur, so I may be trying this very soon! That’s a great tip about putting newspaper underneath! Great snack for kids!! Thanks for sharing on My 2 Favorite Things on Thursday…hope to see you again this week!! Pinned! These apples look great! Thanks for sharing with us at Merry Monday. These sound dee-licious!!! 🙂 Thank you for sharing this recipe idea! We have one of those corer/peelers and I love it, too! Does the excaliber have metal racks or plastic racks? We got a cheaper local model to learn on; and while we do like it, I’d like to get an excaliber. Hubby wants metal racks and I don’t know if that is possible. Thanks for the great post. Very educational. That makes sense. The metal racks might affect drying. I think ours has 6 trays? Can’t remember at the moment; but I’ve told hubby when we get another one, it needs to be bigger! Thank you!